From the bottom of my heart, thank you so much for all of your support around this special announcement! Below, I am answering the most popular questions that I have received here on the blog, on Instagram, in emails, etc. I figured it would be best to keep it all in one place! If you have a question that has not been answered, please let me know in the comments as I am trying to get back to everyone as fast as I possibly can! And, stay tuned as all of my styling and outfit posts featuring items from the collection will begin on Monday, October 8th. I’m beyond excited to highlight the variety within the collection with a series of thematic posts! Q: When is the collection available? A: It launches on nordstrom.com at 9am EST and in 36 stores on 10/22. For the complete list of the stores click here! Q: Are you doing any appearances/events? A: Yes! I am so excited to announce I will be in Chicago at the Michigan Avenue location on 10/17 – where you can actually SHOP the collection before it goes live – and in L.A. at the Nordstrom Local Melrose on 10/24. In order to attend the pre-shop Chicago event you’ll need to be a part of the Nordy Club. Signing up and becoming a member is incredibly easy, and you can do so here. Q: What is the price range of the pieces? A: $39-$249 across shoes, accessories and apparel. The vast majority of the collection is under $100! Q: What is the size offering? A: The size range for the collection is 00-24! Shoes are offered in sizes 4-9, 10, 11, 12. Please note not every apparel item is offered up to size 24, but the majority of the collection will be! 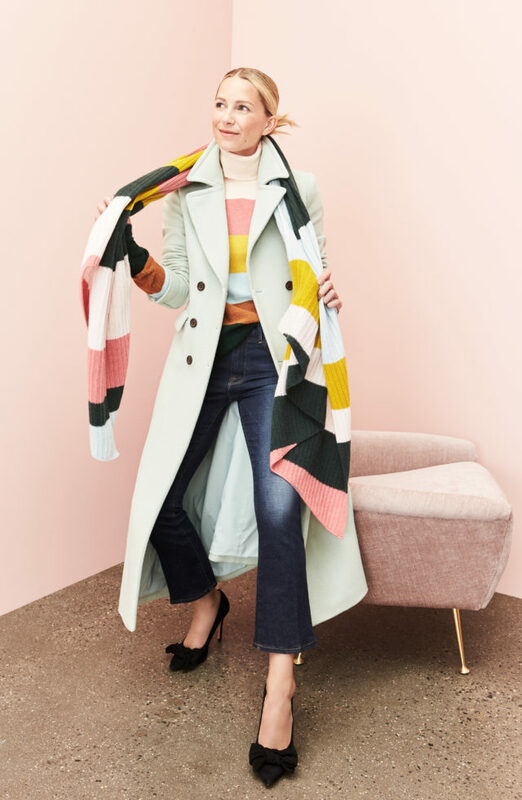 There will be a limited petites offering, but Nordstrom does offer incredible on site tailoring for those styles not offered. Q: Will it ship internationally? A: Yes! You can read about the Nordstrom’s international shipping policy here. Q: How many pieces are in the collection? A: Across shoes, apparel and accessories there are over 150 items! We did not produce any handbags, jewelry, or sunglasses, so as I am styling I will be using many of my own pieces to complete the looks. There are so many amazing styles and I can’t wait to show you all of them! 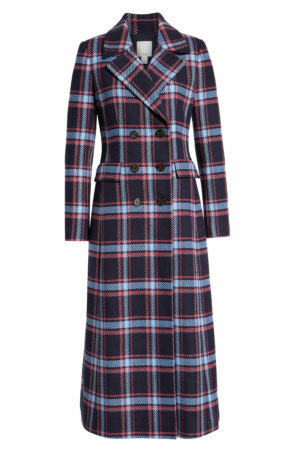 A: It is so incredibly hard to choose, but I would say the pink triple bow blouse may be my favorite, but very closely followed by the midi length plaid coat! Q: Is this an ongoing collection? Will there be another one? Will there be replenishment if it sells out? A: This is a limited edition, one time collaboration. At the moment, there are no plans for another collection. We also do not have plans to replenish inventory. Q: How did this whole collaboration come about? When did you start working on it? Why Halogen/Nordstrom? What role did you play in the process? A: Nordstrom approached me last year to discuss the possibilities of working together on a line. Having worked in the industry for 10 years as a merchandiser, I was so excited about the possibility of working on product again! Nordstrom was a great fit as a partner as I have worked with them for over 7 years and really respect their company values. They are always forward thinking within the space, early adopters in their support of influencers, and completely dedicated to high quality customer service and product offerings. After showing an initial concept and inspiration for a line – a ‘retro romance’ theme grounded in a cosmetic palette and feminine details – we were completely aligned on what the capsule could be. From there, we hit the ground running. From the beginning I was clear I wanted this capsule to be a stand alone concept with the ability to seamlessly mix and match pieces to create a multitude of outfits within the collection. I wrote a line plan reflecting that desire and at every step of the process we discussed each piece, but also spent hours pouring over how the outfitting would come together. I snuck away to Seattle for every milestone meeting (sketch review, proto review, final fitting/styling, etc.) but was also in touch with the teams weekly – if not daily – on all updates and changes. While also creating the product, I was simultaneously meeting with the PR, marketing, and events teams to ensure the messaging around the collection felt cohesive. It was imperative that the collection felt on-brand for both Atlantic-Pacific and Halogen. And, we managed to keep the whole thing under wraps until just a few days ago, purposely choosing to reveal the collection much closer to the launch date. While I played a large role in this entire process, to say ‘I created this collection’ would not be true. The amount of time, energy, and talent that goes into creating a 150+ item collection, creating an amazing marketing campaign, and producing and executing three best-in-class events takes a ton of people. A heartfelt thank you to the design, PD, production, planning, buying, store ops, PR, marketing, events, Nordstrom Live team, and the countless others at Nordstrom who partnered with me to make this happen! Q: How would you describe the collection in 5 words or less? A: Feminine, Colorful, Quirky, Versatile, Graphic. Q: What was your favorite part of the process? A: My last trip out to Seattle was for styling and final fittings. It was a ‘hold your breath’ moment. Throughout the ideation phase of creating a collection, there are a lot of possible unknowns that may arise, and you have to trust the process. A sample might arrive in a incorrect color standard. The fit isn’t finalized. The fabrication used was available and not your standard. The factory didn’t have time to actually sample garment in your print, and the list goes on and on. You have to envision what can be, not always what is. When you see a piece for that last time before it goes to final production – you hope that all those things you imagined will come together in the perfect way. It is a big, messy, fun puzzle to piece together. During that final trip, when I saw everything for the last time – and all of the pieces and outfitting executed as we had planned – I was bursting with happiness. I have worked on over 60 different collections/seasons in my career and that last moment when you finally see everything can be totally amazing, or a complete scramble to re-work the entire collection. For it to all come together in the exact way we had dreamed was my most rewarding moment. Q: Does it run true to size? A: I am 5’7 and wear a size 0/2 for reference – and yes – the collection fits true to size. Q: Why did you wait to announce until 10/3? A: The industry has been changing at lightening speed. Much of the consumer feedback has been they want to buy goods in season (not pre-season) and they want immediacy. They do not want to see something in February and not be able to shop it until October. With this collection I wanted to take a different approach than the traditional brand/retailer and deliver a fall collection when you actually need to shop fall and not have a huge build up. I didn’t want fatigue to set in, or people to be disappointed with too long of a lead up. I wanted to surprise everyone with an announcement, have the press preview and kick-off event that same day, and then have customers be able to shop very shortly thereafter. It is certainly a different approach, and somewhat of a departure from past collaborations in the industry, but I felt it was a risk worth taking. Q: Was it hard to continue to run Atlantic-Pacific as ‘business as usual’ while also taking on this project? A: Yes, for sure, but luckily since my entire career was spent creating product and working cross functionally to build collections, the learning curve was not as steep for me. I could jump right in and hit the ground running with the Nordstrom team. I also consider myself quite decisive so I just had to kick it up a notch! Over the past year I have been heavily focused on making quicker decisions, prioritizing, and learning to let go of some of the ‘nice to haves’ that I no longer had time for. Blair! This is so exciting! Congratulations!! Everything looks amazing, and I can’t wait to see your styling, and get to shop the collection later this month! You nailed it! Congratulations, Blair! I’d have to say you are my favorite fashion blogger/influencer. It’s because you seem like a genuinely nice person. Your posts don’t come off snooty or bragging, and you respond to comments from time to time. (I hate it when bloggers snip at people. Granted, I know some folks like to be harsh with fashion bloggers, but the best response to them is to ignore them and just move on.) Your collection looks great – can’t wait to pick up a piece or two!!! Such a wonderful accomplishment … Always a lovely ♥️ Post! So thrilled for you – LOVE the plaid coat!! I AM SO SO Sorry! It is the 24th, I just updated the copy to reflect!! I am excited to come out west and I hope to see you. Thank you so much for the support and I apologize again for the mix up! Congrats! I’m sure that the collection will be a hit. 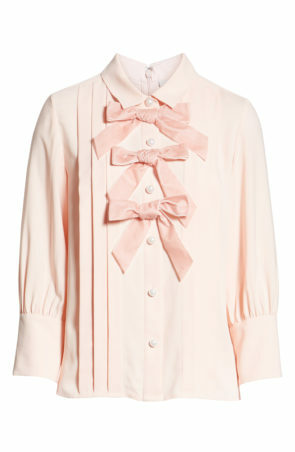 I simply must have the pink triple bow for stylish niece. This collection is amazing babe! I want that plaid coat! OMG! Congrats!!! This is so exciting. I’m such a fan of Halogen already, but this makes it even better! I got SO excited when the video came up on my insta feed. I’m equally as excited that your range will be available for shipping worldwide. I cannot wait to see the range in-depth. Congratulations Blair, this is so great! This looks like a wonderful collection! Congratulations! I can’t wait to see how you style these items. This is so exciting and very well deserved Blair! I’ve been following you for years and I can’t wait to shop the collection! I am happy the pricing is in line with my budget too – thank you! Congratulations! Congrats on this project! This looks amazing and I can’t wait to shopping the collection. BTW, is there a lookbook where we can see all the pieces? This collection has even caught my husband’s eye – we are both excited for me to add some of these pieces to my closet. I’ll probably go to Newport Beach on opening day but am hoping to come see you in LA! What are the details for your LA event?